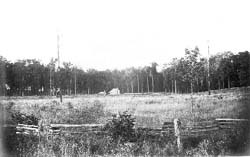 European settlement permanently changed the character of Illinois forests. This section presents information on how the settlers used forest resources for building materials, fuel, and food. It describes the settlement of forested lands, how they were initially used as agricultural areas, and how they were later used to support the timber industry. It also addresses the changes in forests caused by fire suppression. The early settlers favored the forested regions of Illinois over the prairies. The reasons the settlers preferred the forests over the prairies were both practical and spiritual. Many came from forested environments in the south and east. Generations before them had lived in the forested regions of Europe. There was a sheltering aspect to the forests that was lacking out on the open prairie. The forest provided trees that were needed for construction materials and fuel. Settlers entered the state mainly from the south. Many settlers came from Kentucky and Tennessee, a few from the north and east, and some emigrated from Europe. The southern counties along the Mississippi and the Wabash Rivers were well settled before 1818, and in general, settlement proceeded northward along the forested rivers and streams. The settlers found in the forests a wealth of resources they could use to make Illinois their home.